Today did not turn out quite as expected. We had already decided that Sutton-on-Sea was too ambitious, but Chapel St Leonards seemed a reasonable target. We took a taxi back to where we finished yesterday – actually, a little further down the road so that we could get back onto the sea wall. 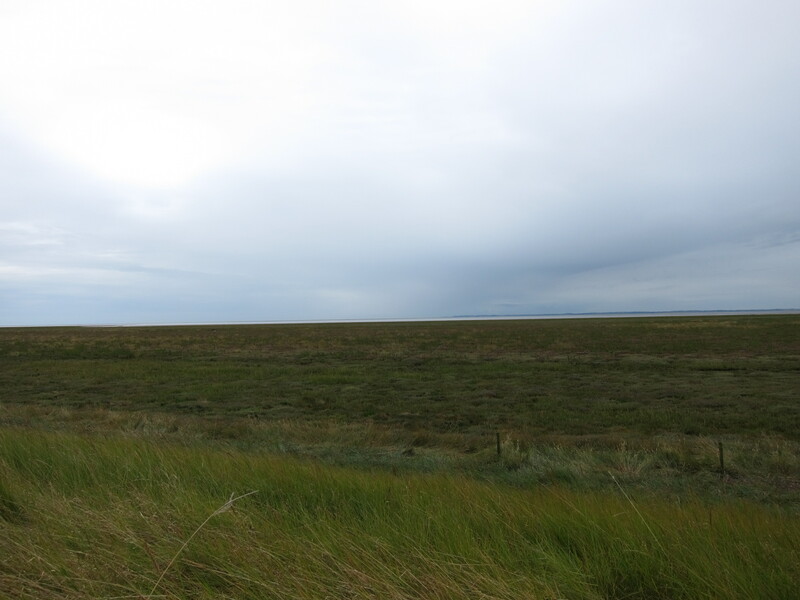 The scenery did not vary from yesterday with mile upon mile of marsh and, just toward the horizon, the mudflats. The landscape is strangely sinister. I don’t mind walking alone, but it was good to have someone with me as, despite not seeing a soul, it felt as though we were being watched. There were no bovine incidents today and we meandered on. We came to the end of the marsh, opposite Gibraltar Point, a noted wildlife reserve. According to the map, all we needed to do was cross the dyke, now wide and deep enough for various small craft. The map showed a slipway, but it was covered in thick, deep mud for at least six feet on either side of the water way. We regarded it with disfavour and consulted the map for an alternative. 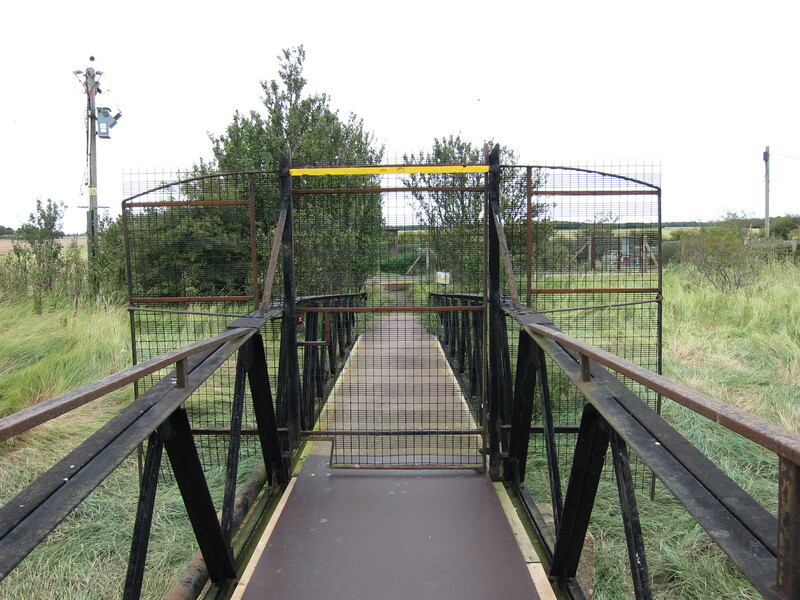 No problem – a few hundred yards upstream was a footbridge. We approached it in due course, a rather rickety looking metal affair. We read the signing, warning of trip dangers and proceeded down the steps to the bridge. Unfortunately, the gate on the far side was firmly padlocked. The gate itself was a good 7 feet high. Clearly previous walkers had clambered over it as the evil-looking spikes on top had been bent over. “Do you think you could get over that?” asked Rachel. “I think I could.” I will add at this point that Rachel is very much taller than me with exceptionally long legs. She could probably have stridden over it in one step. We consulted the map again. It wasn’t raining, but it was pretty miserable and the ground was wet underfoot, soaking Rachel’s lightweight shoes. According to the map, there was a further crossing point some 800 yards further. We trudged along, beginning to feel grumpy. This would add at least 3 extra miles to the day. On we went, towards the farm buildings that the marked crossing led to. Of course, the route was blocked with a barbed wire fence. We decided that were three options: we could trespass, not appealing; go back and try climbing the gate or wade across thick mud of unknown depth. We thought that if we were sure about the existence of the crossing place that we might risk trespassing, although we didn’t fancy it, but the reliability of the map at this point had been less than a hundred per cent. As we hummed and hawed we saw a figure approaching through the field ahead. “Great, now we are going to be shot at by an irate farmer,” we thought. We approached the fence and explained our predicament to the farmer. Fortunately, he did not have a shot gun and was willing to let us walk through his yard if we could get over the fence. I whipped out the map and folded it over the barbs, hopping over into a field which contained a good half dozen ponies. Up came the farmer’s wife (or sister..?) who was very friendly and told us all about the horses – gipsy cobs, apparently. She was a mine of information about the care of the sturdy little beasts. Mrs Farmer was keen to talk – she probably doesn’t see many people out in the Fens. She was a local girl – apparently Lincolnshire folk are “yellow-bellies”. The commercialisation of Skegness obviously upset her – she was adamant that it is Skegness, not “Skeg” and definitely not “Skeggy.” The renaming of the High Street as Chip-pan Alley was clearly a sore point. We lingered for a while to chat, then asked advice on the best way back to the sea wall. The map showed a track called New Road, which we thought might be a route leading back to Skegness, but Mrs Farmer told us it went through private land and that the owner was distinctly unfriendly. More map reviewing…. Our only option was either to walk at least 5 miles along the busy A52 or to go to Havenhouse station and get the train into Skegness. 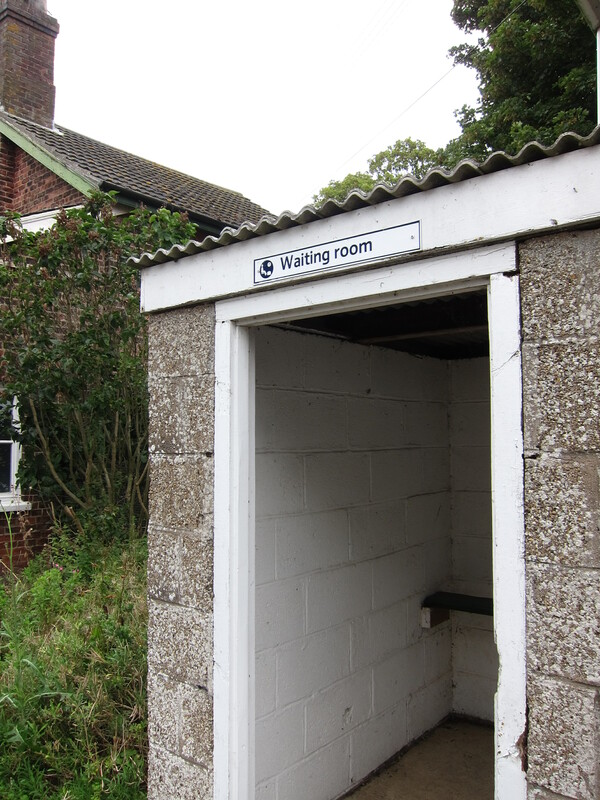 We opted for the latter…unfortunately, on Bank Holidays there are no trains so another taxi was required. By now it was pouring with rain so we decided to abandon the walk and console ourselves with the best fish and chips in Skegness. We fetched our bags from the hotel and are now on the Skegness to Grantham train which is chock full of enormous suitcases and screaming children. A fairly low level 10 miles today but a fun weekend overall – the only disappointment being that the sea has not been visible at any point. 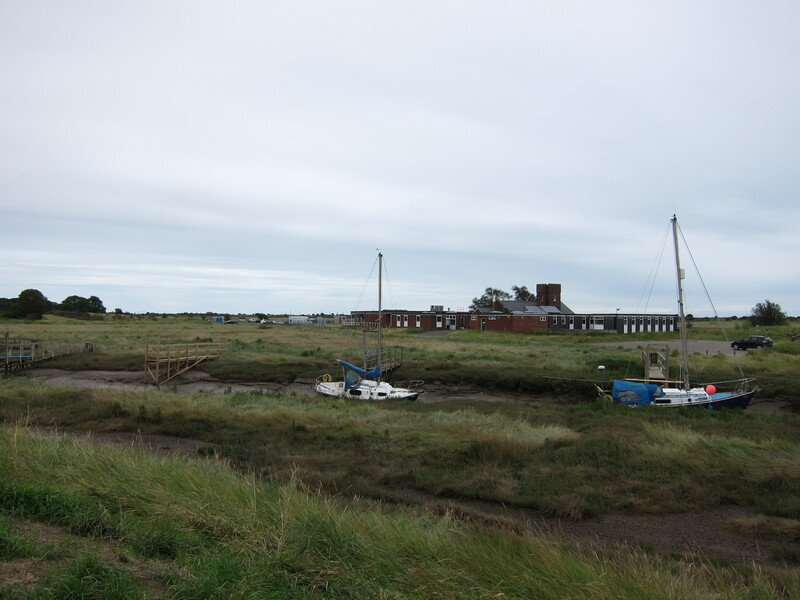 This entry was posted in Lincolnshire and tagged Fens, Gibraltar Point, Lincolnshire, Skegness. Bookmark the permalink.